Kobe Bryant (born (1978-08-23)August 23, 1978) is a American former professional basketball player. He most recently played for the Los Angeles Lakers of the National Basketball Association. Bryant played as a shooting guard. During the 2005-2006 season, he scored 81 points in a game against the Toronto Raptors. He is considered as one of the greatest basketball players of all time. Bryant retired on April 13, 2016 after scoring 60 points in a Lakers win against the Utah Jazz. 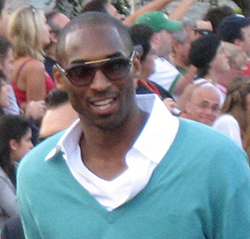 Bryant won five championship rings from 2000-2002 and again in 2009-2010. He was awarded the Most Valuable Player in the 2007-08 NBA season after the Los Angeles Lakers went to the 2008 NBA Playoffs as the first seed in the Western Conference. Bryant's retired No.33 jersey and banner at the Lower Merion High School gym. 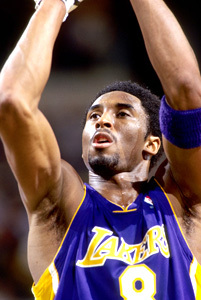 Bryant was a member of the Lakers teams that won three consecutive NBA Championships from 2000 to 2002. Bryant prepares to shoot a free throw in 2005. Bryant scored a career high of 81-points against the Toronto Raptors in Staples Center, second-highest single scoring performance in NBA history, surpassed only by Wilt Chamberlain's 100-point game in 1962. Bryant scored fifty points or more in four consecutive games and ten total in the 2006–07 season. 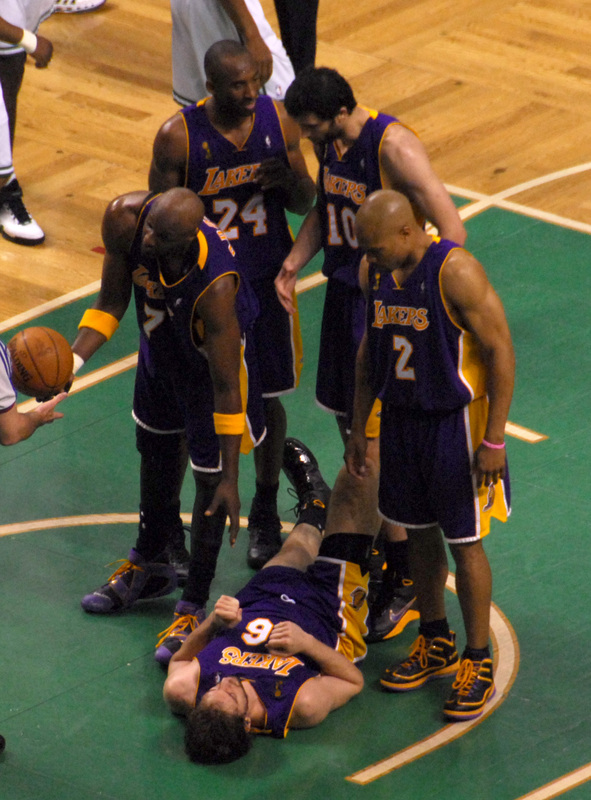 Bryant's Lakers lost to the Boston Celtics in 6 games during the 2008 NBA Finals. Bryant and Lakers meet with President Barack Obama in honor of 2010 championship. Bryant wearing mask in 2012 after suffering broken nose. Bryant dunking against the Milwaukee Bucks in 2013. Bryant shoots a fadeaway over Shane Battier in 2009. Bryant at Sprite commercial event in Shanghai in 2011. Kobe Bryant Facts for Kids. Kiddle Encyclopedia.